Jenny's Baylor Freshman Welcome Week theme was "All in the Family," which appropriately describes her Baylor connection -- 30 of her extended family members have attended Baylor University. Five cousins are attending this very year. Jenny graduated with a Bachelor of Science degree in 1978 and a master's degree in Guidance Counseling with a Language Learning Disability specialty in 1980. Jenny has been a wonderful Baylor ambassador while being a devoted wife of husband Jay Allison and busy mother of four children, Jency, Logan, Lucas and Aubrey. Her most recent title is "grandmother." Jenny's professional career began in Waco public schools, where she worked with special needs students. She has continued to follow her passion for working with students and supporting education, especially where it promotes Christian values. Jenny and her family helped to create Legacy Christian Academy in Frisco, Texas, which is now in its 13th year and has over 700 students enrolled. Jenny also helped create a scholarship fun run to benefit Frisco ISD students. In addition to supporting BUWC's Barnabas Circle, Jenny and Jay have provided scholarships for Collin College, Dallas Baptist University, Howard Payne University and Baylor University. Jenny and Jay are partners in generous giving. They are recipients of the James Huckins Award, which recognizes generosity to Baylor, and their contributions helped build the Baylor basketball workout facility and remodel the Baylor football stadium skyboxes. The indoor practice facility in the Highers Athletic Complex bears their names. The LHSON and the Baylor Alumni Association have been recipients of their generous contributions as well. Jenny was president of the Baylor Women's Council of Dallas in 2008-2009 and has opened her home for numerous BUWC meetings, Baylor young grad parties and student gatherings. Jenny was a catalyst for the wonderful relationship between BUWC and LHSON. However, her behind-the-scenes tasks reveal her "distinctive" generosity of spirit and kindness. Many "thank you" presents, treats and other thoughtful expressions have come from Jenny without fuss or fanfare. "Whatever you do, do it as though working for the Lord." Jenny is now an empty nester with three of her children attending Baylor this year. She spends her time commuting to Waco and playing with her new granddaughter in the hopes that she can influence the next Reid/Allison generation to keep Baylor University "all in the family." It is our honor to present this true Woman of Distinction for 2012. 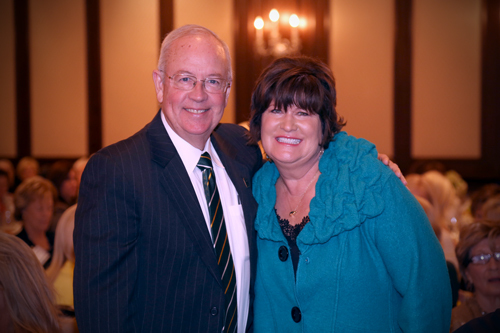 Ellen Byrd is a Baylor grad extraordinaire! Green and gold threads are richly woven into a life filled with service and commitment to family, church, community and profession. A graduate with a Bachelor of Science degree in Nursing from Baylor School of Nursing, now known as the Louise Herrington School of Nursing (LHSON), in 1964, Ellen is part of a great Baylor legacy. Her five siblings are all Baylor alumni. Continuing the Baylor Line, Ellen married a Baylor grad, C. Robert (Bob) Byrd (BBA '62), and they have four children: Byron (BBA '88), Preston (BBA '92), Aaron, and Robyn. The Byrds have five grandsons -- Zach, Josh, Andrew, Lewis, Isaac -- and one granddaughter, Allison Ellen. Ellen has been an active alumna of the nursing school. She served as President of the LHSON Alumni Committee from 1989 to 1991, completing the first Nursing Alumni Directory. She served as Co-Chairman of the Centennial Reunion Committee for the 100th anniversary of the nursing school and was named on the "100 Legends in the Line." Ellen served on last year's task force for the Going for the Gold Gala, raising scholarship money for nursing school students. Currently, she is Coordinator of the Alumni Committee and serves on the LHSON Dean's Board. During her professional career, Ellen worked as a registered nurse at several Dallas hospitals. However, her passion has always been for working with students, as evidenced by her service as campus nurse for the Dallas and Richardson school districts and as Director of Health Services at Dallas Baptist University. This year marks the 25th Anniversary of BUWC-Dallas, and it also marks 25 years of service to our organization for Ellen Byrd. She was a charter member and served BUWC-Dallas as its first secretary and as president in 1994-1995. Revealing her servant's heart, she has participated in nearly every BUWC committee and is an honored member of the Barnabas Circle. 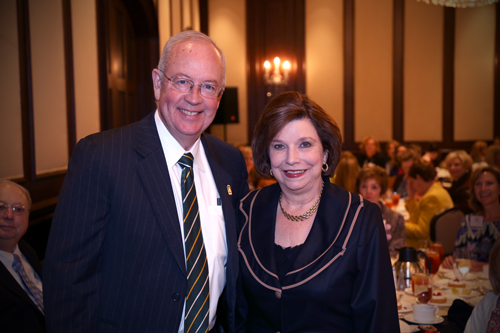 In addition to her service to BUWC, Baylor University has benefited from Ellen's membership in the Baylor Alumni Association Council, Baylor University 1845 Society and the Old Main Society. She also received the W.R. White Meritorious Service Award in 1996. In her community, Ellen is a member of the Richardson Junior League. She has served as president of Dallas Baptist Women's Auxiliary Board and as a trustee of Dallas Baptist University (DBU). Ellen received the Ruth Award from DBU in 2006. She has served on the Board of Visitors at Wake Forest University. She and her husband are members of Cliff Temple Baptist Church where she served as a deacon. Ellen always is quick to write personal notes of gratitude and encouragement to fellow workers and friends. Today, we turn the tables and recognize Ellen for her life of service and celebrate this Woman of Distinction for 2012.